At St Ives Junior School, we embed technology as part of everyday learning. All classrooms have interactive whiteboards and also a visualiser, which allows staff to model learning effectively, raise expectations and provide feedback to pupils. 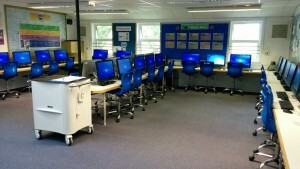 The Hub (our ICT suite) is well equipped with 34 state of the art desktop computers and pupils make use of a wide range of portable devices including Chromebooks and iPads throughout the school to enhance learning outcomes. Pupils collaborate and share learning online through Google Drive and we make use of a number of the ‘G Suite for Education’ apps to record and present learning. We employ a full time technician, Mr Moon, to manage our network and ensure we have the greatest network ‘up’ time so no learning opportunities are lost. Our Computing curriculum sees pupils learn a wide range of skills using a variety of hardware and learning platforms so that they become flexible and discerning ‘digital natives’. Click HERE for a link to the SIJS Computing curriculum. An integral part of our curriculum involves teaching pupils to make discerning choices online and keeping themselves safe in the digital world. Our PHSE curriculum, Jigsaw, also places great emphasis on digital well-being. We have created a series of characters called the SIJS Techno Squad to scaffold making the right choices for pupils. We regularly liaise with families regarding how to support their child in their virtual world through our school newsletters and Facebook page and have provided parents and carers with digital well-being briefings. Pupils are also able to revisit learning at home through our subscription to a number of online learning platforms including Mathletics, Spellodrome and Brainpop. We also run lunchtime and after school computing clubs with a learning focus and The Hub is busy from before school starts with pupils grappling with targeted learning.